“This tractor does two things - it turns the land and turns us off the land. There is little difference between this tractor and a tank. The people were driven, intimidated, hurt by both. We must think about this." "If the olive trees knew the hands that planted them, their oil would become tears." As a new Gaza Flotilla gets ready to set sail, despite numerous criminal acts of sabotage and a never-ending barrage of Israeli government propaganda, the New York Times' Ethan Bronner (with the help of his trusty sidekick Fares Akram) has been doing his best to divert attention away from the suffering in Gaza by publishing articles showing how wonderful and luxurious life is in a besieged open-air prison. On June 28, Bronner published a piece entitled, "A Bountiful Harvest, Rooted in a Former Settlements Soil." The Times online header read: "Gaza Establishes Food Independence in Former Israeli Settlements." Beyond the obvious agenda inherent in these banners, the piece itself peddles age-old Zionist tropes of historical revisionism, land redemption and blooming deserts. Hundreds of acres of watermelons, orange saplings and grapevines stretch in orderly rows out to the horizon. Irrigation hoses run along the sand, dripping quietly. Apple trees are starting to blossom nearby. Avocados and mangoes are on their way. Gaza, cut off by Israel and Egypt for the past four years and heavily dependent on food aid, is expanding an enormous state-run farm aimed at gaining partial food independence. Most striking is that the project sits in the center of the coastal strip on the sites of the former Israeli settlements whose looted greenhouses and ruined fields became a symbol of all that had turned sour in the Israeli withdrawal six years ago. Let's look at the basic humanitarian facts on the ground. Ninety five percent of water in Gaza is undrinkable. Forty percent of disease is waterborne, it's caused by poor water. 45.2 percent of the labor force is unemployed. Eighty percent aid dependency. A tripling of the abject poor since the blockade. There's clearly a crisis in every aspect of life in Gaza. A recent report by the World Food Programme revealed that only 20% of Gaza's population could be classified as "food secure," while "the prevalence of Gaza household food insecurity remains very high at 54 percent with an additional 12 percent of households vulnerable to food insecurity." The report also found that 38% of Gaza residents live below the poverty line, noting that "[w]ithout social and humanitarian assistance, nearly half of the Gaza population would be under the poverty line (48.2 percent)." Bronner writes of Israel's removal of "9,000 settlers and all of its soldiers from Gaza in 2005," at which point "[t]he settlers’ high-tech greenhouses, which were bought for the Palestinians with $14 million in donations, were left unguarded and within days were stripped of computer equipment, irrigation pipes, water pumps and plastic sheeting." He omits the fact that Gaza remains occupied territory, controlled externally on all sides - land, sea, air - and constantly under attack by the Israeli military. Bronner describes the economic siege and collective punishment of a civilian mundanely as "security procedures on exiting trucks" imposed by Israel after "an attack on the border." In truth, the result was a near total ban on exports which has devastated Gaza and made impossible any sort of economic recovery. The chart below, taken from a 2010 report by the Palestine Trade Center, shows annual export trends from June 2006 to July 2010. Between November 2010 and May 2011, only 290 truckloads of exports were allowed to leave Gaza, despite the supposed "relaxation" of the siege in June 2010. These totals represent "only 5 percent of the pre-blockade export volume", when more than 960 truckloads exited Gaza each month. Israeli human rights organization Gisha recently reported, "Between November 2010 and April 2011, Israel exceptionally allowed export of a minimal amount of strawberries, flowers, peppers and tomatoes from Gaza to European markets." Gisha also revealed that "the average rate of export during that time was two truckloads per day" and that "since May 12, 2011, no trucks carrying goods for export have left the Strip." Bronner boasts of increased productivity, the rebirth of settlement areas, farms which are "expanding every year" and providing "jobs for 500 people, as well as fruits and vegetables for large segments of Gaza's 1.6 million inhabitants," as well as "100 tons of grapes and 23,000 tons of watermelons" produced and sold locally. He describes meetings held over "spiced coffee...slices of crisp apple and cucumber." For the former Jewish settlers, who began coming here in the 1970s, the loss of their livelihoods and homes when the Israeli Army removed them remains a source of trauma. The way they mourn and remember their loss bears at times a striking resemblance to the way Palestinian refugees mourn theirs. At a small museum at the entrance to Jerusalem named for the former settlement bloc, Gush Katif, that loss is on display: the keys to a former synagogue hanging on a wall, a cup of broken glass from its windows nearby and color photographs of smiling farmers in their greenhouses cultivating yellow peppers and geraniums. Farming was the core of the settlers' lives here. They provided 10 percent of Israel's agricultural output and 65 percent of its organic greenhouse vegetables, exporting $25 million worth of produce annually. Many of those settlers remain in transitional housing inside Israel and in West Bank settlements. The failure of the Israeli government to resettle them properly has been yet one more argument offered in Israel against settler withdrawals for a Palestinian state. There is no moral or legal equivalence between the fate of refugees forced by a conquering army from homes their families had occupied for generations, and the status of settlers installed by a conquering regime that later pulls them out. Nonetheless, it is ironic that the Israeli government appears to be employing the same technique — of using displaced persons to support an argument about an international dispute — that Israelis have long accused Arab regimes of utilizing. As if to add insult to injury for the poor uprooted colonists, Bronner also reveals that "what was the settlement of Gan Or, part of the fields ha[ve] been renamed Mavi Marmara" (he describes last year's execution of nine peace activists as the result of "tussles onboard") and sorrowfully reports that the synagogue of the illegal Gaza settlement of Gadid, a "six-sided structure dear to the hearts of many former settlers," has suffered an even more unspeakable fate: "Today it is a mosque." Bronner quotes former colonial farmer Shlomo Wasserteil, founder and curator of the Gush Katif Museum in Jerusalem, echoing the Zionist line of desert-bloomism when recalling his arrival in Gaza all those years ago. "There was nothing but sand, not even a bird, like the Sahara," Wasserteil says. "We produced the best tomatoes in the world. We revolutionized cultivation in sand and taught our neighbors in Jordan how to do it." That sentiment was reiterated last May during an Independence Day celebration by Israeli President Shimon Peres, who praised Zionist achievements this way: "We proved we can create a budding garden out of obstinate ground." And just last week, Prime Minister Benjamin Netanyahu, addressing the World Zionist Organization in Jerusalem, connected Zionist land redemption to the ongoing illegal colonization of the West Bank. "We are settling and developing the land – it is possible to see towns in Ariel, Ma’ale Adumim and Gush Etzion," he said, "But we are also obligated to develop all parts of the country – the Galilee and the Negev." Israeli journalist and historian Meron Benvenisti has explained that such statements are the essence of classical Zionist mythology, reinforcing "the image of all Arabs as sons of the desert" and pitting "the barbarous desert against progress and development." The bible finds no worse image than this of the man from the desert. And why? Because he has no respect for any law. Because in the desert he can do as he pleases. The tendency towards conflict is in the essence of the Arab. He is an enemy by essence. His personality won't allow him any compromise or agreement. It doesn't matter what kind of resistance he will meet, what price he will pay. His existence is one of perpetuate war. The Arab was "not only the son of the desert but also the father of the desert," in the famous words of Major C.S. Jarvis - the British governor of Sinai - which were adopted by the Zionists. And thus the fallahin [non-nomadic Palestinian farmers] - tillers of the soil for generation upon generation - could easily be transformed into "bloodthirsty desert savages," who not only sought to annihilate the Jewish community but also were guilty of turning Eretz Israel - flowing with milk and honey - into desolate desert. In the textbooks for course in Knowing the Land, the Arabs are portrayed as being responsible for the ecological ruin of the entire country: they destroyed the ancient farming terraces, thereby causing soil erosion and exposing bare mountain rock; because of them the streams were blocked and the coastal valley became a land of malarial swamps; their goats ravaged the ancient forests that had covered the Land; with their violent feuds and their murderous hostility toward all agents of progress, they turned the Land into a perpetual battlefield. Hence the Zionists did not rob the country's inhabitants of their land; they redeemed it from desolation. But the truth is that the Palestinian soil didn't actually require expert Jewish agricultural know-how to produce fruits, vegetables, and the myriad other crops native to the land. Pre-Israel Palestine was not quite the barren dustbowl of Zionist fantasy - far from it. Upon visiting Gaza in the 14th Century, Syria geographer al-Dimashqi described it as "so rich in trees it looks like a cloth of brocade spread out upon the land." More recently, in the early 20th Century, Gaza historian Ibrahim Skeik recalls the dazzling views of "trees all about the city, olives and almond groves." In December 1945 and January 1946, a comprehensive Survey of Palestine was conducted and published by British Mandate authorities on behalf of the United Nations Special Committee on Palestine. The survey revealed that the land was rather prosperous for Arab Palestinians and Jewish farmers alike. 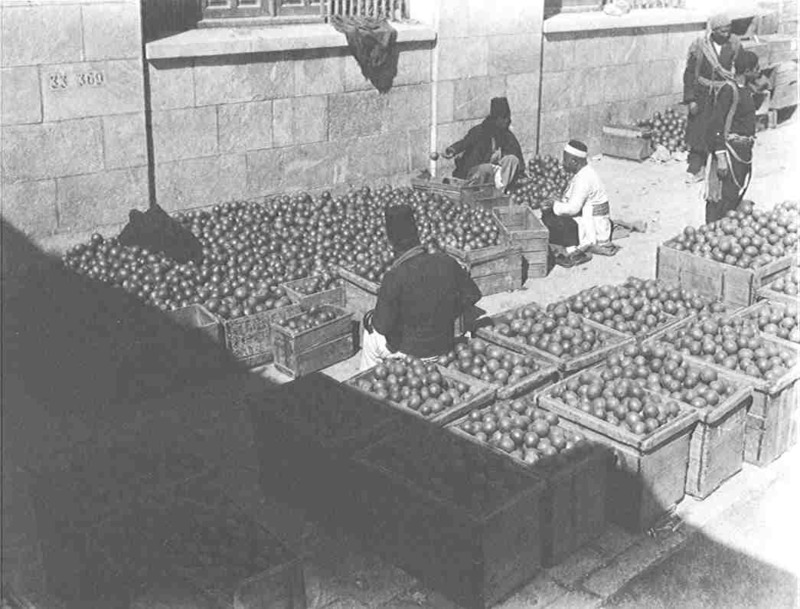 During the 1944-1945 planting season, nearly 210,000 tons of grain were cultivated in Palestine, of which 193,376 tons (92%) were Arab crops, compared to 16,579 tons of Jewish crops. Almost 80,000 tons of olives were cultivated that year, over 78,000 tons (98%) of which were grown by Arab Palestinians. Of the over 244,800 tons of vegetables produced in Palestine that season, Arab farmers were responsible for more than 189,000 tons (77%); of the 94,700 tons of fruit, Arab orchards produced 73,000 tons (77%). 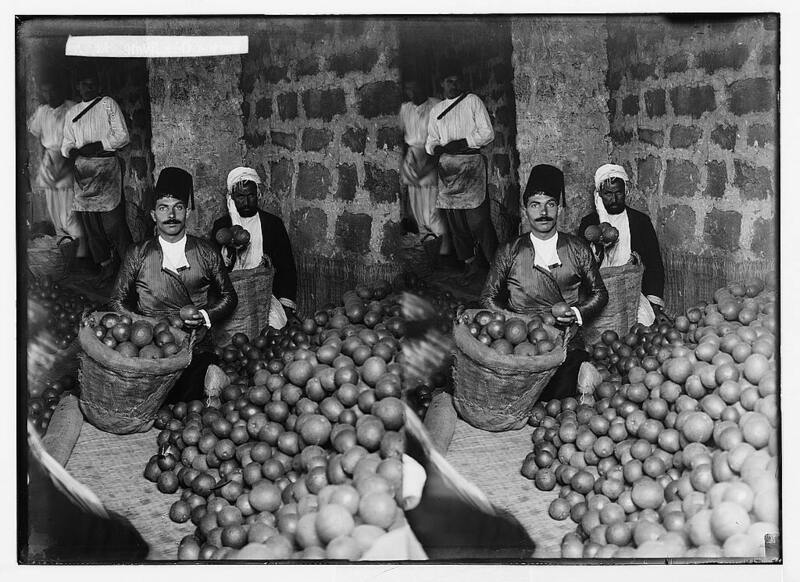 Almost all of the region's citrus groves were Palestinian owned and operated. Nearly 143,000 tons of melons were cultivated, over 135,600 tons (95%) of which were Arab-produced, while almost all of the more than 1,680 tons of tobacco grown were on Arab farms, as were 20,000 tons of figs and 3,000 tons of almonds. Eighty percent of the 40-50,000 tons of grapes and 4-5 million liters of wine were produced in Arab vineyards. The survey found that in Jericho, Tiberias, and in the central coastal plain, "about 60 per cent. of the area (nearly 8,000 dunums) planted with bananas is Arab owned." The overall price of the Palestinian agricultural yield that season was more than £21,800,000. Jewish cultivation was responsible for nearly £4,711,000 compared with Palestinian Arab production of over £17,100,000, accounting for almost 80% of total value. Less than two years later, in November 1947, the United Nations recommended that the indigenous Arab majority of Palestine (then consisting of about 70% of the population) establish a state of their own on 44% of its historic homeland, while the 30% Jewish minority (consisting mostly of recent immigrants from Europe) would get 56% of Palestine, despite the fact that the minority owned less than 8% of the land at the time. When that suggestion was understandably rejected by Palestinian representatives, a unilateral declaration established a Jewish State of Israel in Palestine and, in the ensuing war, Israel snatched an additional 22% of Palestine as its own. In 1948, during what Israelis proudly refer to as their "War of Independence," over 450 Palestinian towns were ravaged, abandoned and destroyed, including villages that had signed non-aggression pacts with their Jewish neighbors; over 750,000 Palestinians were driven from their own homes. Ethnic cleansing and land theft laid the foundation of the new state. Zionist resettlement began immediately. Benvenisti tells us, "Even villages that had not been captured by Israel, and whose residential sections were situated in the (Jordan-held) West Bank, did not escape land confiscation. More than sixty villages located on the Jordanian side of the armistice lines lost large portions of their landholdings, which were on the Israeli side." "In fact," he writes, "the takeover of land began shortly after its military occupation. By April 1948 Jewish farmers had already begun harvesting the crops that had ripened in the abandoned fields and picking the citrus fruit in Arab groves." So much Palestinian farmland was seized by Israel through extra-legal means and retroactive absentee laws that "by mid-1949 two-thirds of all land sown with grain in israel was abandoned Arab land." For a colonial-settler state that often takes great pains to reiterate its historic connection to and love of the land it now controls, over the past six decades Israel has taken ever greater steps to destroy the very land it claims to value so much. Soon after the Nakba, Palestine's famed citrus groves suffered "blatant neglect" as they "were not irrigated after the departure of their owners. Water pumps and pipelines were dismantled and stolen, and no one was interested in taking care of the trees." As Benvenisti explains, "The Jewish citrus growers were barely capable of caring for their own groves once the cheap Arab labor on which they depended had left." 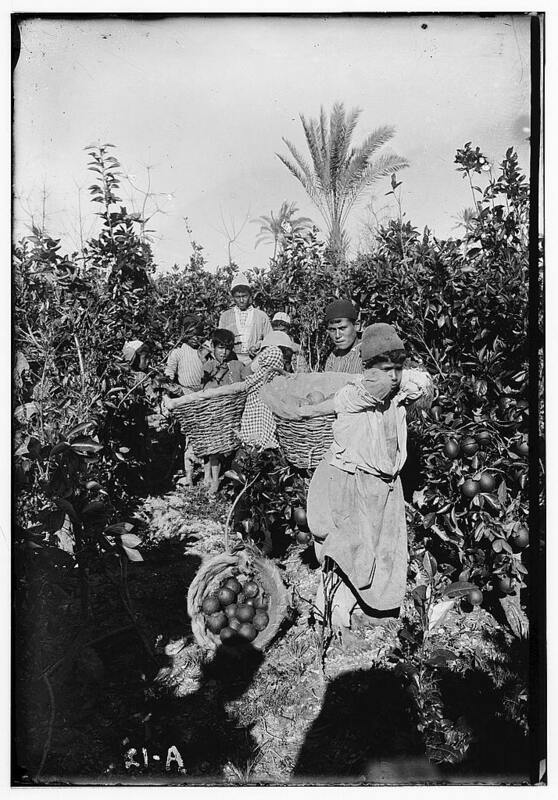 Tragically, "the overwhelming majority of the 150,000 dunams of citrus trees - the most valuable agricultural crop left behind by the Arabs - remained untended" and "as a result, entire tracts of productive citrus trees, especially in the Tel Aviv-Jaffa area, were earmarked for the construction of housing developments." The same thing happened to abandoned Palestinian olive groves and pomegranate orchards, which were seen by the conquering Israelis as "an annoyance." "Pomegranates from the ancient trees are not fit for marketing," writes Shmuel Dayan, one of the founders of the Moshav Nahalal, a leader of the Moshav Movement, and father of Moshe Dayan. "We shall have to lay out tens of thousands of pounds [old Israeli currency] to uproot them. The residents expect the trees to be uprooted, and will afterwards use the land for growing cattle fodder." To Dayan, the only tried-and-true method of agriculture was that of the classic moshav, and the glorious pomegranate trees interfered with the production of fodder. Before long it became clear that agricultural planning based entirely on dairy cattle and chickens was wasteful. Large surpluses of produce (eggs, milk and dairy products, certain fruits and vegetables) occurred; the agricultural settlements needed to be heavily subsidized, and when subsidies were cut, the immigrant moshavim were thrown into a state of crisis. But the olive and pomegranate trees of the "primitive" Arab village were no more. Tens of thousands of dunams of olive trees were uprooted and replaced by non-indigenous European field crops, which the Jewish settlers preferred, as cultivation required a smaller workforce and less irrigation. The deliberate destruction of fertile land and bountiful groves and orchards was also integral of the Zionist enterprise, which relied on denying Palestinians the right to return to their own land. Consequently, Benvenisti writes, "the stronger the international pressure for the return of the refugees (throughout 1949-50), the greater the efforts to destroy the agricultural infrastructure that might have made possible the absorption of the returning refugees." The destruction of hundreds of thousands of dunams of fruit-bearing trees does not fit Israel's self-image as a society that knows how to "make the desert bloom." And the contention that the green Arab landscape had been destroyed because of the necessity of adapting crops to the agricultural practices of the Jews only underscores the conclusion that it was not the war that had caused this devastation, but rather the disappearance of the specific human community that had shaped the landscape in accordance with its needs and preferences. The destruction of vast areas of orchards did not attract the same degree of interest as had the demolition of the Arab villages, despite the fact that it perhaps had a more devastating effect on the landscape. And yet, this past May, a Ha'aretz report was proud to announce that since the founding of Israel, "exports have soared 13,400% from $6 million to $80.5 billion." Ami Erel, chairman of the Israel Export and International Cooperation Institute, boasted, "From an exporter of oranges in the early years, Israel has become a developed country." Ha'aretz pointed out that Israeli "[a]griculture represented only about 2% of the country's exports in 2010." The natural ecology of Palestine has further been altered by the Israeli obsession with planting artificial forests of pine trees. Max Blumenthal has written that "the pine trees themselves were instruments of concealment, strategically planted by the Jewish National Fund (JNF) on the sites of the hundreds of Palestinian villages the Zionist militias evacuated and destroyed in 1948...The practice that David Ben Gurion and other prominent Zionists referred to as 'redeeming the land' was in fact the ultimate form of greenwashing." Yet, these non-native species are not well-suited to the Palestinian environment. 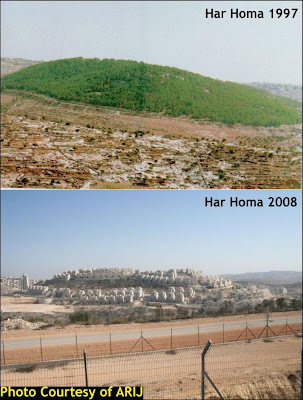 According to Blumenthal, "Most of the saplings the JNF plants at a site near Jerusalem simply do not survive, and require frequent replanting. Elsewhere, needles from the pine trees have killed native plant species and wreaked havoc on the ecosystem. And as we have seen with the Carmel wildfire, the JNF’s trees go up like tinder in the dry heat." The devastation continues. Israel and its colonial outposts in the West Bank consistently destroy what remains of Palestinian olive trees and wheat fields. Try as he may, Ethan Bronner's efforts to rewrite the history of Palestine are fruitless. The truth is sown in the soil. July 5, 2011 - For more on Netanyahu's contempt for the land of Palestine and the environment in his never-ending crusade to colonize and Judaize every last square inch, read this new Ha'aretz article entitled "For Netanyahu, saving Israel's deserts is all about settlements" and written by Zafrir Rinat, who describes the Israeli Prime Minister as being "solid as a rock not only with regard to the right of the Jewish people to settle their land, but also in his insistance on seeing nature and landscape as no more than an obstacle to the realization of his settlement vision." July 14, 2011 - Mondoweiss contributor Annie provides additional impressive and invaluable information regarding the Zionist trope of the Arab as "savages of the desert." In 1891, after a journey to Palestine, Asher Zvi Hirsch Ginsberg aka Ahad Ha’am (known as the founder of Cultural Zionism) "warned against the 'great error', noticeable among Jewish settlers, of treating the fellahin with contempt, of regarding 'all Arabs a(s) savages of the desert, a people similar to a donkey.'" July 14, 2011 - It should also be noted, as Mondoweiss commenter "Shingo" deftly points out, that before the thousands of Jewish colonists in Gaza were removed in 2005, they made sure to destroy many of the greenhouses and agricultural facilities they were leaving behind so as to vindictively sabotage future Palestinian economic development after their departure. Naturally, this aspect of the story is omitted by Bronner, who only mentions that Gaza greenhouses were "looted" by Palestinians after settlers left. About half the greenhouses in the Israeli settlements in Gaza have already been dismantled by their owners, who have given up waiting to see if the government was going to come up with extra payment as an inducement to leave them behind, say senior officials working on the coordination of this summer's Israeli pullout from Gaza." Journalist Steven Erlanger, who preceded Bronner as NYT Jerusalem bureau chief and who wrote the piece, reported, "Of the roughly 1,000 acres of agricultural land that were under greenhouses in the 21 Israeli settlements in Gaza, only 500 acres remain - creating significant doubts that the greenhouses could be handed over to the Palestinians." Nevertheless, at the behest of former World Bank head James Wolfensohn, $14 million was raised to pay departing Jewish settlers not to destroy the greenhouses. The settlers, every single one of whom was an illegal colonist of occupied land, had "complained that the Israeli government was not offering sufficient compensation, and they have threatened to dismantle or destroy computerized irrigation systems and other valuable equipment needed to keep the greenhouses running." So, while the settlers were generously compensated for greenhouses (which had been "heavily subsidized by the Israeli government" to begin with, in contravention of international law) in a deal that was to cover "about 90 percent of the more than 1,000 acres of greenhouses in Gush Katif, the main settlement cluster in Gaza," The New York Times reported at the time that "journalists who have been to the area recently say a good number of the greenhouses have already been at least partly dismantled." By November 2005, only three months after the so-called "disengagement", the Times was already touting the economic opportunities of Palestinians in Gaza who were benefiting from the greenhouses. Correspondent Greg Myre reported, "Palestinians have repaired scores of greenhouses left by the settlers and planted a fall crop, and they are preparing to harvest an estimated $20 million worth of strawberries, cherry tomatoes, sweet peppers and herbs and spices. The produce is intended mostly for export to Europe, but some will also be headed to Israel, Arab countries and the United States." In a wicked instance of irony when now viewed nearly six years later, the article states that "Israel says it too has an incentive in seeing Gaza's economy prosper", notes that "a Gaza seaport is planned" and quotes, of all people, Israeli government propagandist serial liar spokesman Mark Regev as saying, "We understand that a successful Gaza economy is a crucial ingredient in the overall success of what is now Palestinian Gaza. And the success of Gaza is a crucial factor in getting the peace process back on track." When the Jewish settlers came to Gaza decades ago, they developed innovative techniques for cultivating high-quality fruits and vegetables in the barren sand dunes, where fresh water is scarce. When the Israeli farmers started leaving, they took their most valuable equipment with them, and some greenhouses were damaged or destroyed. The Times adds, without comment, another interesting piece of information. While Israeli farmers employed 3,000 workers on 1,000 acres of land, the Palestinians, working on only half that amount of land, currently employ 4,000 workers and an additional 2,000 security guards. That doesn't much sound like an efficient (let alone safe) operation that is going to deliver high margins well into the future. And the Times, which projects that the greenhouses will deliver $20 million in revenues, doesn't tell us whether the cost of operating them is likely to be even higher. Two months after the Times report, Hamas won democratic elections and punitive economic sanctions were immediately implemented by both Israel and the 'Quartet', punishing Palestinians for their own self-determination. Beckerman's warning proved correct, as Israel kept the vital Karni border crossing closed, deliberately destroying entire harvests and the hopes of a prosperous agricultural economy in Gaza. Basic food commodities were severely depleted, bakeries closed and food rationing was introduced. The closure also seriously affected the export of produce from the Gaza Strip. The Al-Muntar (Karni) closures have cost Palestinians up to $500,000 a day, according to United Nations Office for the Coordination of Humanitarian Affairs estimates. The report also noted that "UNRWA officials expressed alarm that the general living conditions of the Palestine refugees in the Gaza Strip had become 'deplorable and getting worse'." By the following year, Gaza was under full siege by Israel and Hosni Mubarak's Egypt. The Palestinians invested millions of dollars to repair the greenhouses shortly after the Israelis left, and had an excellent crop in the winter of 2005 and 2006. But they were unable to export their produce to Europe, the main market, because Israel kept Gaza's main crossing for goods closed for weeks at a time, citing security concerns. Incidentally, the Israeli Consulate in San Francisco posted a link to Bronner's New York Times article, and it's not surprising why. With propaganda like that, Israel should be proud. You didn't talk to me !